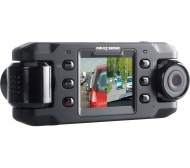 alaTest ha recogido y analizado 12 comentarios relacionados al producto NEXTBASE iNCarCam DUO Dash Cam - Black. En promedio, la calificación para este producto es 3.8/5, al ser comparado con la calificación 4.1/5 de otros productos en la categoria Filmadoras. La gente está encantada con la calidad de la imagen. La portabilidad también obtiene comentarios favorables pero algunos tienen dudas sobre la relación calidad-precio y la memoria. Analizamos las valoraciones de los usuarios y los expertos, la edad del producto y demás factores. Comparado con otros Filmadoras el NEXTBASE iNCarCam DUO Dash Cam - Black recibe una alaScore™ global de 89/100 = calidad muy buena. The dash-cam works exactly as it describes 'on the can'. A thoroughly good product EXCEPT - see bad points. It is infernally difficult to remove and given its necessarily conspicuous windscreen location it significantly raises the risk of damage by thieves to any car left unattended in a public place. Does not seem to lock in position. Too easily moved out of alignment. GPS is unusual, it seems I live in New York USA! Compact camera, lightweight, many features and good quality. A little fiddly, don't like leaving the camera in the car overnight so having to keep turning the parking mode off and disconnect the charge lead every time is annoying, can't see the mounting bracket lasting long. It does exactly what is states, is relatively easy to use. The battery charge dont last long enough without being plugged in. Just kept freezing and when it worked would keep resetting the time to GMT+4? Very annoying. Ended up exchanging for a Nextbase 412GW which is superb!